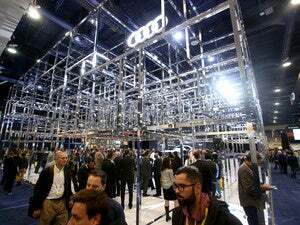 Audi’s E-Tron Quattro is a fully electric sport utility vehicle that can drive itself through traffic jams and find parking spots, but it’s far from a reality. The concept car is what the German automaker sees as the future of transportation, but a car like this might make privacy advocates uneasy. The brain of the car is the central driver assistance controller or zFAS. It’s a circuit board about the size of a tablet computer. The zFAS will process data from the car’s 3D cameras, the laser scanner, radar and ultrasonic sensors. “The zFAS will be capable of continuously comparing the data from the vehicle sensors with the model of the road space,” said Ricky Hudi, executive vice president of electronic development at Audi. “Every vehicle will have access to real time data from the cloud and can plan and react to changing conditions in a smart way,” he said during a press conference at CES. He said that the car would be able to anticipate drivers’ needs after learning their driving patterns and personal points of interest.